The opening vignette of the Fenn’s chapter entitled “Passages” described the arrival of two Indian women in 1811 at the Pacific Fur Company’s post at the mouth of the Columbia River. One of the women upsets members of the local Indian tribe by claiming that she could give them smallpox. 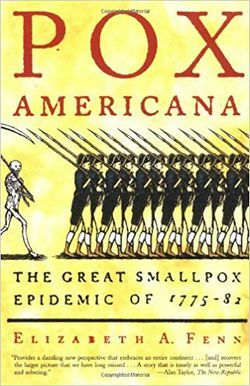 While this story does prove that smallpox arrived during the 1775-1782 epidemic, Fenn used this story to suggest that Variola had reached the Columbia River Valley thirty years before. Like much of the evidence used in this chapter, Fenn has skillfully woven together several different narratives to create one storyline. For this example, Fenn used several firsthand accounts including Alexander Ross’s Adventures of the First Settlers on the Oregon or Columbia River (1849), the Richard Glover version of David Thompson’s Narrative (1962), and a number of other secondary stories to craft this account. Fenn used this vignette to suggest that Indians from this region were familiar with smallpox and were justifiably angered by the Indian women’s threat to spread smallpox, but the vignette fails to prove anything. While Fenn accurately cites the Thompson and Ross texts, these observers fail to explain when this epidemic occurred. Fenn then examined the accounts of earlier European travelers to the Pacific Northwest to determine whether or not they could have started the epidemic. Fenn stated that over eighty Russian fur trading missions went from Siberia to North America from 1744 to 1789. Even though the Russian traders had transmitted smallpox to Indians as far south as Sitka, Alaska in 1768 and 1769, Fenn argued that these outbreaks were localized. Fenn relied on the account of Grigorii Shelikhov to demonstrate that the regions farther north and west of Stika (areas often occupied by Russian fur traders) remained smallpox-free until the 1790s. Shelikhov’s account appeared to be the sole source for this claim by Feen that smallpox had not struck before 1783. Based on this evidence, Fenn concluded that the Russians could not have transmitted the disease during the 1770s or 1780s. It is impossible to determine whether or not Shelikhov’s account merits Fenn’s faith without a direct examination of the text. Fenn also rejected the notion that Spanish explorers who visited the Pacific Northwest during the 1770s could have given the Indians. Fenn argued that Variola did not attack any crew members on any of the potential expeditions that visited the Pacific Northwest because the historical records of these missions failed to mention any smallpox deaths of the crew. While these voyagers were not free of illness, the sailors suffered from scurvy, not smallpox. Fenn did not believe that these crew members would have confused these two illnesses. Fenn cited the published records of these voyages to confirm this claim. Fenn’s claim that James Cook’s expedition to the Pacific Northwest could not have transmitted smallpox to the Native Americans is perhaps the most secure. Fenn’s evidence is based on the eyewitness accounts of eight crew members who did not identify any smallpox infections after the Cook left Plymouth, England. Additionally, these same crew member accounts asserted that the Nootkan’s on Vancouver Island had not been infected with Variola by 1789. Fenn believes that these pieces of evidence shift any potential infections to unknown continental sources or the Ignacio de Artega expedition to Bucareli Bay (located off the western coast of Prince Wales Island). Fenn relied on three separate eyewitness accounts from the Artega expedition to conclude, that the Artega mission left before the Mexico breakout of smallpox. Fenn assumed that because the crew members were silent about smallpox outbreaks or attributed deaths to other diseases, Variola did not accompany Artega north. Ultimately, Fenn found that it was plausible that the North American smallpox epidemic stretched into the Pacific Northwest by crossing North America. Fenn argued that smallpox was passed from tribes to tribe across North America until it reached this region. Fenn cited Asa Bowen’s and Gregory Mengarini’s accounts as evidence that smallpox had been transmitted from one tribe to another. While it is not clear when Mengarini wrote down his recollections of this time period, Bowen did not visit this region until the 1840s. Bowen guessed that there was a smallpox epidemic 60 to 70 years earlier. The remoteness in time and Bowen’s guess regarding the timing of epidemic undermine Fenn’s argument. While Lewis and Clark clearly identified tribes of Indians that had been infected by smallpox between 1800-1802, none of the evidence provided by Fenn can comfortably demonstrate that the Pacific Northwest suffered from the 1775-1782 smallpox outbreak. While Fenn has eliminated several potential vectors for the disease, she has not been able to show how or when the smallpox was transmitted. While it would be reasonable to conclude that Fenn’s arguments are solid, it may be difficult to prove her claims using these sources. This page was last edited on 6 March 2019, at 19:44.